Portions of Salalah, Oman’s third-largest city, lost electricity as the cyclone made landfall. The Arabian Sea churned Saturday morning, sending mounds of sea foam into the air. The waves ate into one tourist beach, pulling hunks of it away and toppling thatch umbrellas cemented into the sand, reports AP. As Mekunu barrelled overhead, the eye of the storm provided a moment’s respite. At one luxury hotel, which already had evacuated its guests, workers sat down early for “suhoor,” a meal Muslims eat before sunrise during the holy fasting month of Ramadan. They laughed and shared plates by flashlight in a darkened ballroom, the cyclone’s wind a dull roar behind their clatter. 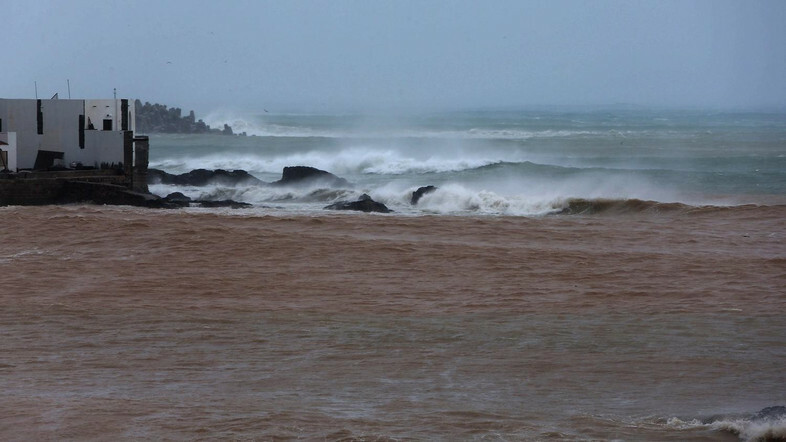 Three people, including a 12-year-old girl, died in Oman, and another two bodies were recovered from the Yemeni island of Socotra, which bore the brunt of the storm, according to local officials in both countries. More than 30 people were still missing in Socotra, including Yemeni, Indian and Sudanese nationals. Yemeni officials also reported damage in the country’s far east, along the border with Oman. Rageh Bakrit, the governor of al-Mahra province, said on his official Twitter account late Friday that strong winds had blown down houses and taken out communication lines and water services. He did not say whether there were any casualties. Many holidaymakers fled the storm Thursday night before the airport closed. The Port of Salalah – a key gateway for the country – also closed, its cranes secured against the pounding rain. A sizable police presence fanned out across the city, the hometown of Oman’s longtime ruler Sultan Qaboos bin Said. Many officers rode in Royal Oman Police SUVs with chicken wire over the windows, likely because their other vehicles weren’t tall enough to manoeuvre through the floodwater. As torrential rains poured down on Friday, authorities opened schools to shelter those whose homes are at risk. About 600 people, mostly labourers, huddled at the West Salalah School, some sleeping on mattresses on the floors of classrooms, where math and English lesson posters hung on the walls. Socotra Gov. Ramzy Mahrous said one ship sank and two others ran aground in the storm, initially saying authorities believed 17 people were missing and presumed dead. Socotra has a unique ecosystem and is home to rare plants, snails and reptiles that can be found nowhere else on the planet.